Great review! I read all of the books except QOS before reading TAB, so I wasn't that attached to Sam because of my attachment to Chaol, but I can see how reading the series this way could have completely changed my view on it. What you said about being attached to Chaol and not Sam is exactly why I think it's important to read TAB first, because I know that if I would have read all of the other books before QoS I would not care about Sam at all. I loved this book! I didn't read this one until after I read Heir of Fire though! It probably would have been better to read it very first, but I didn't buy them in that order. I think that this one was my favorite one to read! I loved getting to know Celaena so well and OMG SAM!!! Celaena is my all time favorite fictional character. I love her so much!!! Awesome review!! I'm so glad that I listened to those who suggested that I read it first. If I had read these books in the order that they came out I don't think I would have cared about Sam at all. I'm actually all caught up with the series and I wasn't in love with QoS. For each book I have liked in this series, follows a book that I didn't like as much. I love TAB but I wasn't in love with TOG. COM was awesome but HOF was somewhere in the middle. 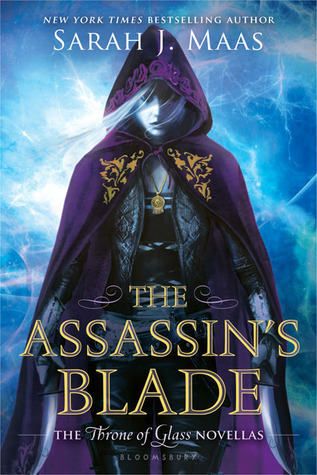 Read The Assassin's Blade first! You'll understand Caelena wayy more. Girl wasn't Sam just beautiful?! I also really enjoyed their relationship, probably more than her and Chaol's. I agree, the first two novellas were definitely slow, but I'm so glad it eventually picked up. I always felt she did this as a way to create a build up, it works for her, but if any other author tried it, I'd probably toss it to the side lol. When I read first reading this book, if it wasn't so hyped up I probably would have pushed the books aside in general but I'm glad that I pushed through it. I found the first to novellas to drag a bit but I also ship Sam and Celaena harder than any of the other ships in this fandom.